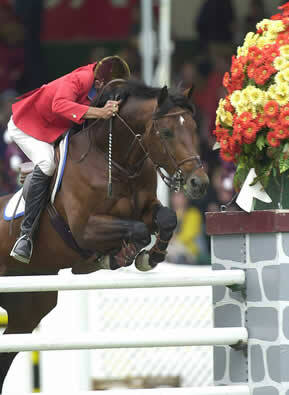 Horalas*Pg*E* began his show career in Lithuania under Rimas Rimkas, becoming the National Showjumping Champion of Lithuania twice, and winning the Vilnius Grand Prix, a World Cup Qualifier in 2001. He was, even then, a well-regarded breeding stallion with five approved sons, including Vikis (Champion of his Approval), and Fiatas who is currently competing at the "S" showjumping level in Europe. 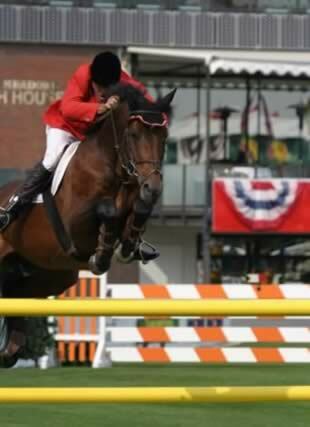 Horalas was imported to the United States by Diane and Jim Rushing, and was heavily competed under the Show Jumping Hall of Fame rider Hap Hansen in Canada and the Western USA. 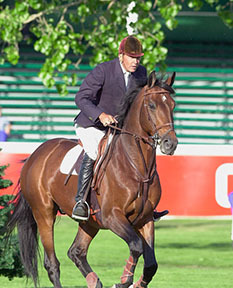 In a few short years, with multiple Grand Prix wins and placings, including at Spruce Meadows CN Classics, he amassed earnings of over $100,000. 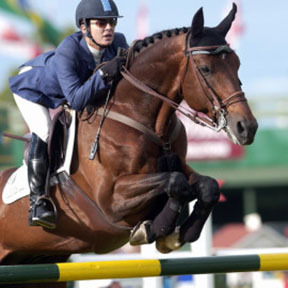 He was retired nearly at the peak of his showjumping career without health problems or injury after the death of his owner Diane. Because of his rigorous competition schedule his offspring are just now beginning performance careers. Horalas joins a very select group of stallions not born in Germany but approved by the Trakehner Verband on the basis of performance career. Horalas passes on his athleticism, work ethic, and jumping talent to his offspring. This is clearly evident in his son DAVIDAS, the first USA born and bred stallion to successfully go through Trakehner Verband's central grading. 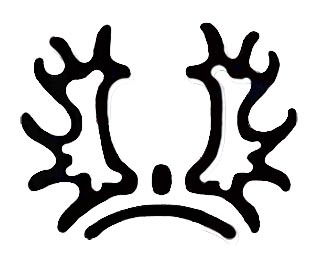 DAVIDAS was awarded a Premium, and an award for the Best Jumper of the Neumünster 2014 Körung.